Discussion in 'iPhone and iPad Games' started by Based Xatu, Jun 15, 2015. 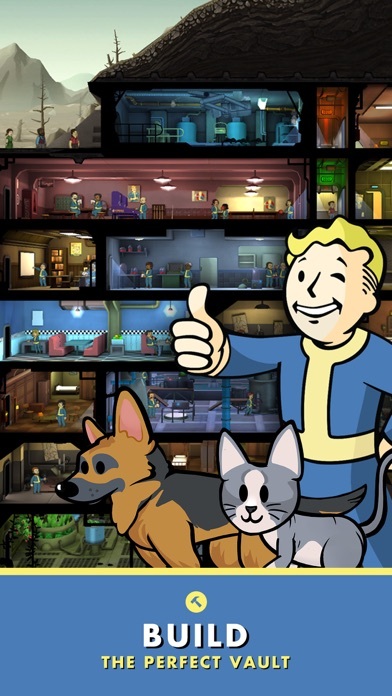 *** App Store Best of 2015 *** Mobile Game of the Year - 2016 DICE Awards Winner 2015 Golden Joystick Best Handheld/Mobile Game "Might just be the best free-to-play game out there" - GamesBeat “Bethesda's first entry into iOS gaming is awesome. 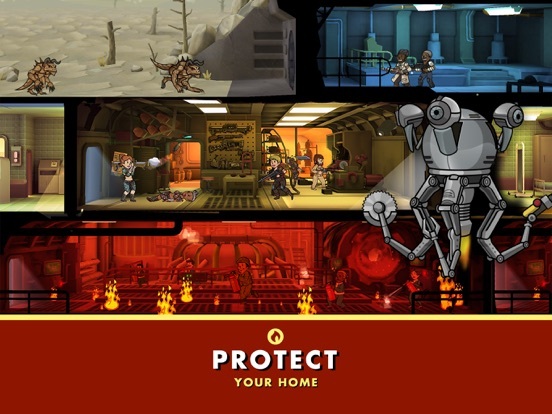 Game of the Week" - TouchArcade "Probably the best game of E3 2015” – Gizmodo "Fallout Shelter is simple to play and addictive as hell." 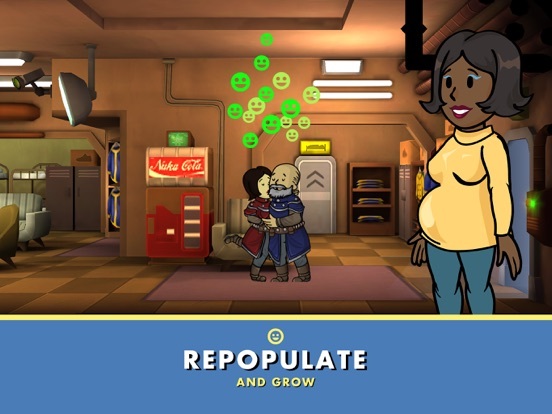 - GameZone Fallout Shelter puts you in control of a state-of-the-art underground Vault from Vault-Tec. 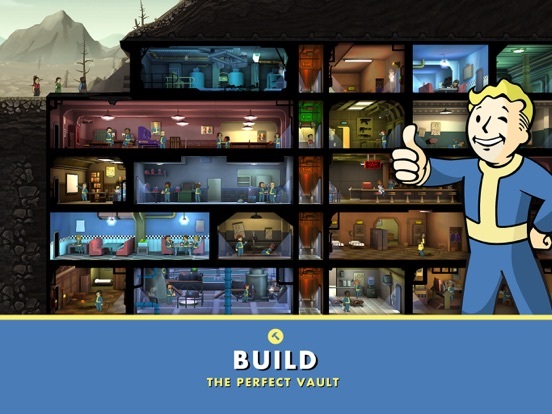 Build the perfect Vault, keep your Dwellers happy, and protect them from the dangers of the Wasteland. 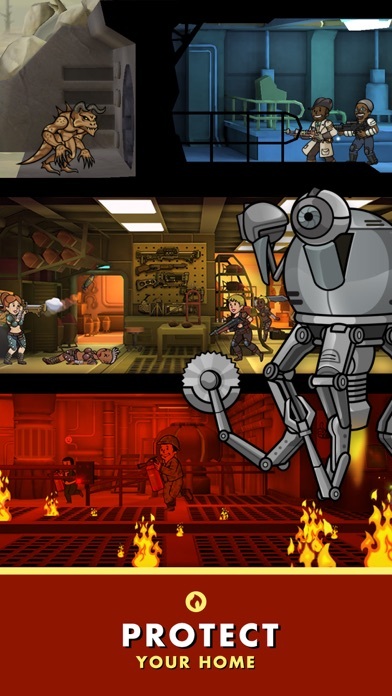 *** Fallout Shelter requires at least an iPhone 5, iPad 3, or iPad mini 2. *** BUILD THE PERFECT VAULT Create a brighter future…underground! Select from a variety of modern-day rooms to turn an excavation beneath 2,000 feet of bedrock into the very picture of Vault Life. OVERSEE A THRIVING COMMUNITY Get to know your Dwellers and lead them to happiness. Find their ideal jobs and watch them flourish. Provide them with outfits, weapons, and training to improve their abilities. CUSTOMIZE Turn worthless junk into useful items with Crafting! Customize the look of any dweller in the Barbershop. 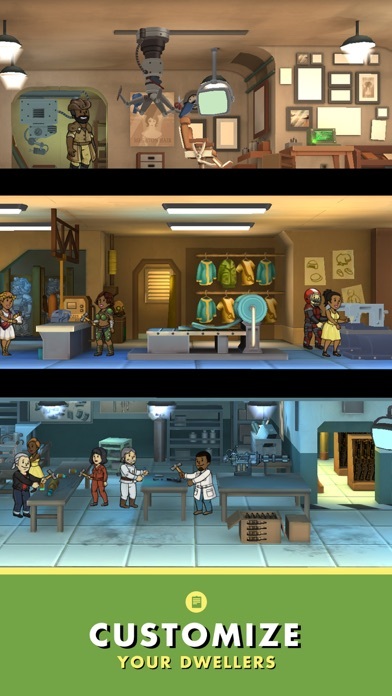 PROSPER A well-run Vault requires a variety of Dwellers with a mix of skills. Build a Radio Room to attract new Dwellers. Or, take an active role in their personal lives; play matchmaker and watch the sparks fly! 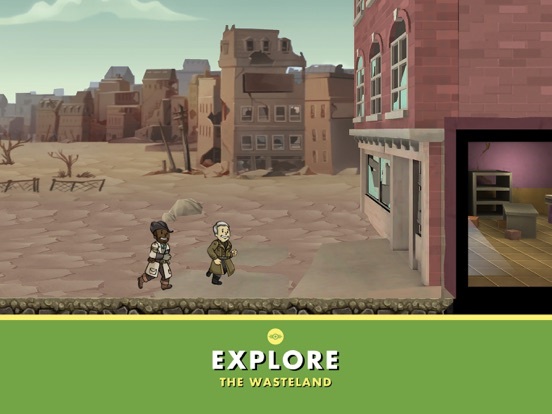 EXPLORE THE WASTELAND Send Dwellers above ground to explore the blasted surface left behind and seek adventure, handy survival loot, or unspeakable death. Find new armor and weapons, gain experience, and earn Caps. But don’t let them die! 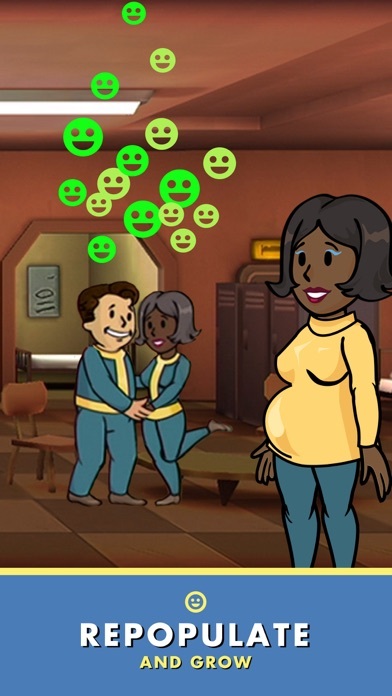 PROTECT YOUR VAULT From time to time, idyllic Vault life may be disrupted by the dangers of post-nuclear life. Prepare your Dwellers to protect against threats from the outside…and within. Vault-Tec has provided the tools, but the rest is up to you. What are you waiting for? 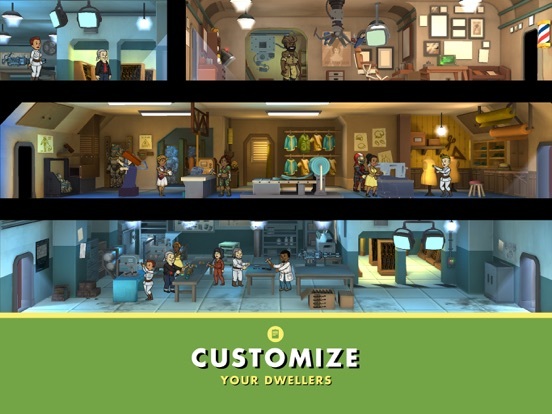 Get started building your Vault today for FREE. Requires iOS7 or later. Compatible with iPhone 5 or later, iPad Mini 2 or later, iPad 3 or later. This app is optimized for iPhone 6, iPhone 6 Plus and iPad Air 2. This app offers in-app purchases. Please note that you may disable in-app purchasing directly from your device. For more information, visit http://support.apple.com/kb/HT4213. No, I'm pretty sure it's universal. A freemium base builder, really? That was the big tease? Just downloaded on my iPhone 6. Compatibility on the app store says iPhone as well. Also shows up in iPhone searches. Don't know what the problem is, I'm downloading it to my phone right now. 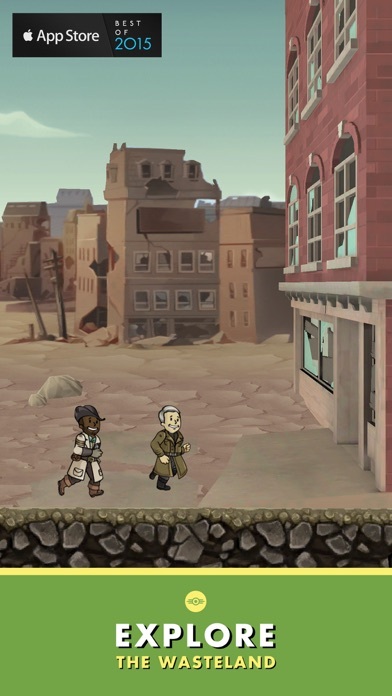 The link in the OP took me to that screen, but a search for "Fallout Shelter" took me to the iPhone version. Downloading now. For that announcement and the hype, I was expecting more than a clunkier version of Tiny Tower. Not all games are worthy of being reproduced on other platforms but FO1 and 2 certainly are. Think of the hours spent on this that could've been put towards a port. Tried it out but it's not for me. Seems nicely done though. I'm sure some people will enjoy it. EDIT: I gave it a second try and I admit I'm very hooked to this game. It seems a Tiny Tower clone, but it's far different from it. I am loving this. I love management games, and the people you oversee have personalities and conversations. The monetazation in this game is awesome, and never makes you feel like you have to spend money and even when you do, you get a lot for a little. Right now I have two men out in the wasteland, one in enclave power armor and armed with a destabilizer, the other in officers clothing and a Gatling laser. This game is so adorable! Sign of the times. Back to Doing most of my gaming on a MacBook Pro these days because I just don't enjoy free-to-play. All links get me to an 'iPad only' screen, I'm not really a fan of this kind of game, but the fallout universe is too dope to not give this one a spin, who knows.. hopefully it surprises me. Sounds like most freemium games, almost zero grind or iAP needed at the start and later on things change drastically. It really depends on the publisher. I have been playing Clash of Clans for 14 months and have spent very little money. I invested in a builder early and buy gems every now and then to speed troops, both of which are completely unnecessary for success. I have a second account that I have never made a purchase with and it is coming along fine. My main is almost completely maxed in every regard except heroes and walls which take quite a long time. I also started playing Crazy Kings a few weeks ago, and again have never felt compelled to spend a dime. I bought a starter pack to help the dev, but was also unnecessary. The other one I play is Adventure Capitalist which I haven't spent a dime on and I am almost done with it. There are plenty of games that have been ruined by IAPs, I think PvZ 2 was definitely a huge step back from 1 for example, but its no surprise since EA was involved. The model can be done well though. In terms of timers they do inevitably increase as you progress but it is not always a detriment to the game. everGirl... your way to play!